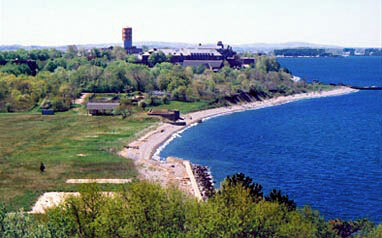 Long Island, the longest and largest (214 acres) of the 34 islands in Boston Harbor, has seen a myriad of uses. It’s been home to a resort hotel, military fortifications, cottages occupied by Portuguese fishermen, a hospital, and even a missile base. Edward Rowe Snow’s book The Islands of Boston Harbor informs us that the island officially became part of Boston in 1634, and that it was divided into lots for planters in 1640. The planters were later charged a yearly rent to help pay for a school in Boston. The island has a healthy dose of legend and lore. Some claim it’s haunted by the “Woman in Scarlet,” the ghost of the wife of a British soldier. The woman was reportedly killed by cannon fire in 1776 and buried in a red cloak. From its inauguration in 1716 into the early nineteenth century, Boston Light served as the only lighthouse for vessels approaching Boston. In 1818, a committee of the Boston Marine Society noted the large number of vessels that passed close by Long Island as they entered the harbor from Broad Sound. The committee sent their recommendation for a lighthouse on Long Island Head to Congressman Jonathan Mason. The island's first lighthouse was a stone tower 20 feet tall, topped by a 7-foot-tall lantern with a soapstone roof. It was built high on a hill at the northern end of the island, with its light 109 feet above the sea. The keeper's dwelling, also built of stone, was attached to the tower. A fixed white light was produced by a system of 10 lamps and reflectors. The light went into service on October 9, 1819. The first keeper was Jonathan Lawrence, a veteran of the War of 1812. Lawrence was a local man who had served in the army during the War of 1812. At the Battle of Fort Erie in August 1814, Lawrence was struck by a bullet that grazed his head, entered his shoulder, and exited through his back. He was one of many wounded veterans of various wars who received light-keeping appointments as favors. Lawrence died at the age of 45 in September 1825, apparently of complications from his war wounds. The next keeper was Charles Beck. Beck was still in charge in 1845 when the writer James Lloyd Homer visited and observed that the keeper had the added duty of running a signal tower for harbor pilots, hoisting a black ball when pilots were needed for an incoming vessel. This system was apparently in use from the earliest days of the lighthouse. The lantern is of the rudest description, and a considerable portion of the light lost by obstruction from the frame work. One lamp of a proper form is sufficient for this locality. A separate inspection in 1843 by Levi Lincoln, collector of the Port of Boston and local lighthouse superintendent, mentioned that the wooden parts of the tower were decayed, and that the glass in the lantern glass had been cracked and broken by a severe winter. In fact, the entire tower, which had a shallow foundation, seemed to have moved as the ground froze and thawed. A new cast-iron lighthouse -- the first of its type in the United States -- was built in 1844. It was similar in appearance to two other New England lighthouses built a short time later, at Juniper Island, Vermont (1846), and Monomoy Point, Massachusetts (1849). A cast iron lighthouse, to be placed on the old site on Long Island Head, has just been completed by the South Boston Iron Company. It is cast in sections of about seven feet each in height, and twelve feet in diameter at the base, and six feet at the top. It is furnished with an iron deck, projecting on the outside so as to furnish a walk round the lantern twenty inches in width finished with a railing. The lantern is made of upright wrought iron bars to receive the glass, having sixteen sides of four feet by sixteen inches, and is surmounted by a cast iron dome or roof, making the whole height thirty-four feet. 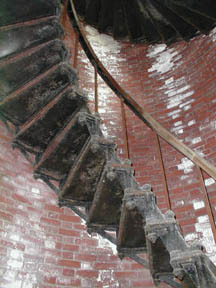 In the centre is a cast iron pipe, extending from the bottom to the summit, which serves as a smoke flue for the stove, and around which winds a circular stair case of cast iron. In 1857, a fourth-order Fresnel lens replaced the old lamps and reflectors. A number of repairs were carried out in 1863, including the replacement of the tower's watchroom floor. A tremendous storm on September 8, 1869, knocked the chimney off the keeper's house and damaged the roof. A skylight window was blown in and the station's fence was damaged. Not long before that, lightning had struck and damaged the boathouse. Necessary repairs were quickly carried out. A new cast-iron lighthouse was built in 1881, along with a new wood-frame keeper's house. The tower was typical of the ones built at many New England locations around that time, with several iron cylinders bolted together. The 1881 tower remained in use for less than 20 years. Left: The third Long Island Head Light (1881). The island's Fort Strong was enlarged around 1900, and it was decided that the light station should be relocated to a position where it would not be "exposed to injury by the firing of guns in the new sea coast battery." A 52-foot cylindrical brick lighthouse was built in the new location in 1901. The keeper's house and outbuildings were moved rather than rebuilt. The following year's annual report announced that a boathouse had been added to the station, and that the tower's color was changed from unpainted red brick to white. On January 8, 1918, Edwin Tarr, who had become keeper in 1906, died while sitting in his chair facing the harbor. A few days later, Tarr's funeral was held in the keeper's house. A sleet storm arrived during the service. When the pallbearers emerged with the casket, they found the steep hill coated with a sheet of ice. As the four men attempted to carry the casket down the path, one of them slipped and lost his grip. The coffin fell to the ice and began to slide on its own. The men, seeing no other option, jumped on the coffin in an attempt to slow it down, and they rode it down the hill like a toboggan. The coffin came to rest just at the head of the wharf and further catastrophe was averted. One of the pallbearers, a soldier at Fort Strong, related the incident to Edward Rowe Snow, who immortalized the macabre story in The Islands of Boston Harbor. 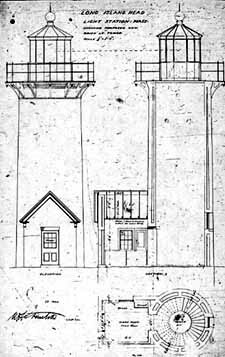 Right: Plans for the 1901 tower. U.S. Coast Guard. After Tarr's death, various custodians attended Long Island Head Light until 1929, when it was converted to automatic acetylene gas operation. The keeper's house and other outbuildings were removed at some point after automation. Fort Strong was eventually abandoned; some of the fort's structures still stand in disrepair. 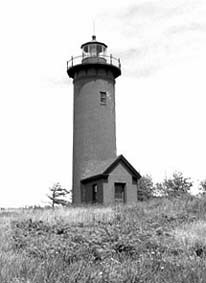 In 1982, the Coast Guard discontinued the lighthouse. In 1985, The decision was reconsidered in 1985 and the tower was renovated, a solar-powered optic was installed, and the light became active again. The lighthouse received a major renovation in the summer of 1998, carried out by the Campbell Construction Group of Beverly, Massachusetts. The tower and lantern were repainted, and some of the original brick, mortar, and ironwork were replaced. A resort hotel on the island was bought by the City of Boston in 1882, and it evolved into a poorhouse and then a hospital. The facility later became a homeless shelter and alcohol and drug abuse treatment center. A 3050-foot bridge to Long Island, called the Long Island Viaduct, was built from the city of Quincy in 1951, but the island was off-limits to the general public. In 2014, the bridge was closed to all traffic after inspections deemed it unsafe. Access to Long Island Head is currently by boat only, and the site remains closed to the public. Ownership of the lighthouse passed to the National Park Service in June 2011. An inspection in late 2011 showed problems from excessive dampness inside the tower. An early 20th century scene at Fort Strong. Long Island Head Light can be viewed from any of the boats leaving Boston's Long Wharf for George's Island, and from many of the other scenic cruises in the harbor. The lighthouse can also be seen across the harbor from the public walking trail around the perimeter of Deer Island, which is accessible from the town of Winthrop. Jonathan Lawrence (1819-1825, died in service); Charles Beck (1825-c. 1850); George Henchman (c. 1850-1857); Richard Nichols (1857); John H. Litchfield (1857-1861); John Spear (1861-1864); Pliny B. Small (1864-1881); Thomas H. Lyndon (1881-1894); John B. Carter (1894-1906); Edwin Tarr (1906-1918, died in service).